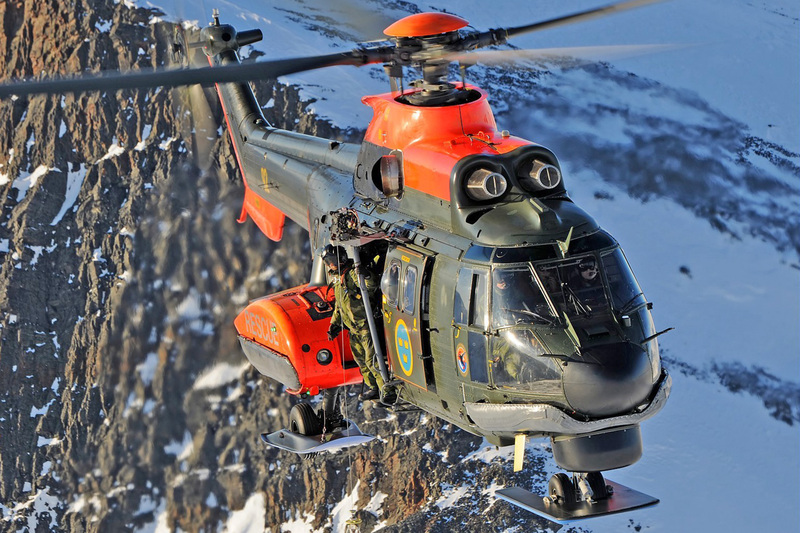 Swedish Defence Material (FMV) and Ex-Change Parts AB have signed an agreement for the sale of Super Puma helicopter system with 6 ea. AS332M1 helicopters including a large support inventory of engines, components, spare parts, GSE and special tools. The transaction was approved by Swedish and French authorities in July and delivery to Ex-Change Parts will be completed in October. We are glad to welcome Daniel Mattsson to our team at Ex-Change Parts AB. Daniel will be working with parts and components at our warehouse in Borlange. Daniel has previously been working as aircraft mechanic at Svenska Direct Flyg AB and as maintenance technician within several other areas. 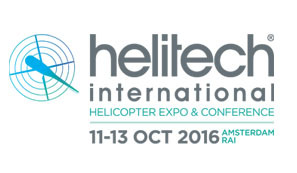 Our salesteam will be visiting the Helitech Expo in Amsterdam on the 16th-18th of October. If you´re interested to meet with us, pls contact Mr Erik Edgren on erik@ex-changeparts.com / cell +46 730 88 87 24 or Mr Elmir Andersson on elmir@ex-changeparts.com / cell +46 73 274 44 29 to arrange a meeting. to set up a meeting. .
We will be visiting Singapore Airshow at the Changi Expo Centre in Singapore on the 6th to 11th of February 2018. If you´re interested to meet with us please contact Mr Eric Olsen eric.olsen@ex-changeparts.com, cell +46 70 768 67 05 to set up a meeting. Ex-Change Parts AB are proud to inform that we are ISO 9001:2015 certified. We have during the autumn upgraded our company and now we have received the new release. It is with great pleasure we can announce that a new CEO, Mr Elmir Andersson, has been appointed at Ex-Change Parts AB. Elmir has many years of experience from After Sales and Service in the automotive business. In his previous position, he was Division Manager for the After Sales & Service division, at Yamaha Motor Europe N.V. Filial Sverige, responsible for the sales of parts and accessories as well as technical support in Scandinavia for all Yamaha products. We will be visiting China Helicopter Expo in Tianjin on the 14th and 15th of September 2017. If you´re interested to meet with us please contact Mr Eric Olsen eric.olsen@ex-changeparts.com, cell +46 70 768 67 05 to set up a meeting. We will be visiting HeliRussia in Moscow on the 25 and 26 of May 2017. If you´re interested to meet with us pls contact Mrs Louise Hülphers on louise@ex-changeparts.com, cell +46 70 870 00 51 or Mr Eric Olsen eric.olsen@ex-changeparts.com, cell +46 70 768 67 05 to set up a meeting. 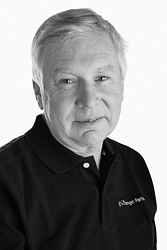 Our colleague Gunde Hjalmarsson has now retired from his employment with Ex-Change Parts. Gunde joined the company in the year of 2000 and has been managing the warehouse since then. We will miss a great colleague and a good friend, and wish Gunde all the best for the future..
We will be visiting the Heli-Expo in Dallas on the 7th to 9th of March 2017. If you´re interested to meet with us pls contact Mr Erik Edgren on erik@ex-changeparts.com, cell +46 730 88 87 24 or Mrs Louise Hülphers on louise@ex-changeparts.com , cell +46 708 70 00 51 to set up a meeting. 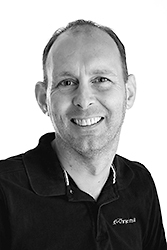 We are glad to welcome Anders Sköldberg to our team at Ex-Change Parts AB. Anders will be working with parts and components at our warehouse in Borlange. Anders has previously been working with aviation at Svenska Direktflyg AB. This year Ex-Change Parts has given a donation to UNICEF as a Christmas gift, to create a better world for all children around the globe. We will be visiting the Helitech Expo in Amsterdam on the 11-13th of October. If you´re interested to meet with us, pls contact Mr Erik Edgren on erik@ex-changeparts.com / cell +46 730 88 87 24 or Mrs Louise Hülphers on louise@ex-changeparts.com / cell +46 708 70 00 51 to arrange a meeting. We are glad to welcome Jonas Höglund to our team at Ex-Change Parts AB. 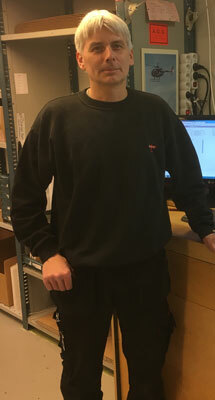 Jonas will be working as engineering manager with parts and components at our warehouse in Borlänge. Jonas has a degree in Aircraft Technology from East Coast Aero Tech in Lexington USA with FAA Certifications and is also an EASA Certified Aircraft Technician. Our AS332L2 S/N 2500 has now arrived to our warehouse in Borlange, Sweden. Ex-Change has purchased an AS332L2 S/N 2500 as a part-out project. The aircraft is currently being transported to our warehouse in Sweden where it´s estimated to arrive in mid-April. Ex-Change Parts has purchased a batch of parts from Erickson Aviation which now has been received to our warehouse in Sweden. The inventory contains parts for Airbus AS332, AS350, SA330, BO105 as well as Augusta Westland 139 and C20. All parts will pass the receiving inspection where pictures of the parts as well as the documents will be registered, and the parts will then be available for sale. 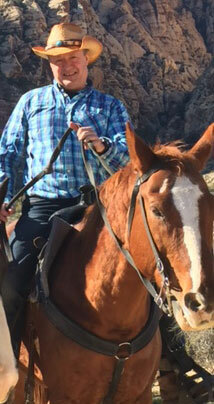 We are glad to welcome Eric Olsen to our team at Ex-Change Parts AB. Eric has previously been working with general aviation in the US. 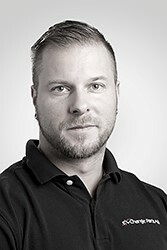 Eric will be working with sales of parts and components and will be located at our Stockholm-office. We will be visiting the Heli-Expo in Louisville on the 1st to 3rd of March 2016. If you´re interested to meet with us pls contact Mr Erik Edgren on erik@ex-changeparts.com cell +46 730 88 87 24 or Mrs Louise Hülphers on louise@ex-changeparts.com , cell +46 708 70 00 51 to set up a meeting. 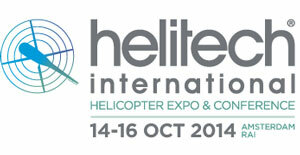 We will be visiting the Helitech Expo in London on 6-8th of October. If you´re interested to meet with us, pls contact Mr Erik Edgren on erik@ex-changeparts.com / cell +46 730 88 87 24 or Mrs Louise Hülphers on louise@ex-changeparts.com / cell +46 708 70 00 51 to arrange a meeting. 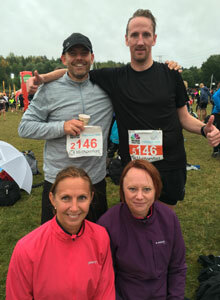 Our team preparing for the Bellman relay race, each runner ran 5 kilometers. We will be visiting the International Paris Air Show on the 15th of June to the 17th of June. If you´re interested to meet with us, pls contact Mr Erik Edgren on erik@ex-changeparts.com , cell +46 730 88 87 24 or Mr Daniel Furubom on daniel@ex-changeparts.com , cell +46 702 48 75 71 to set up a meeting. 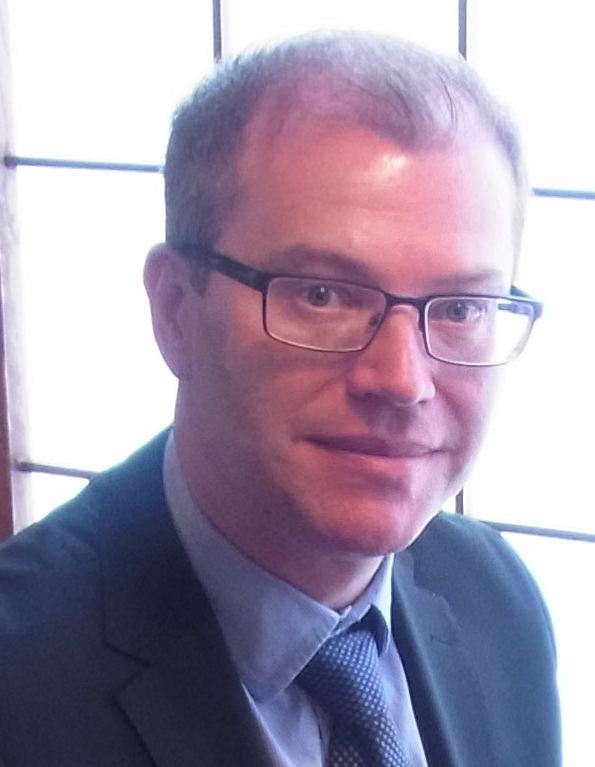 We are glad to welcome Ronald van Bakel to our team at Ex-Change Parts AB. Ronald has previously been working at Heli-One in Australia. He will be working with sales of parts and components as well as project leader, and will be located in our Stockholm-office. We will be visiting Heli-Expo in Orlando on the 3rd to 5th of March. If you are interested to meet with us, pls contact Mr Erik Edgren on erik@ex-changeparts.com , cell +46 730 88 87 24 or Mrs Louise Hülphers on louise@ex-changeparts.com , cell +46 708 70 00 51 to set up a meeting. The Ex-Change Parts team wish all our customers and suppliers a Happy Holiday Season and would like to thank you all for the business in 2014! 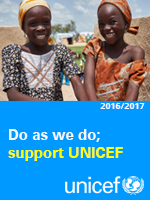 This year we have donated our Christmas card and present funds to UNICEF and their efforts to help children in emergencies. 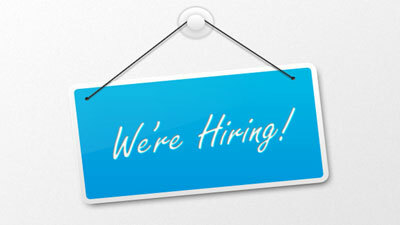 Our office will be December 24th , 25th, 26th, 31st and January 1st. This November, four colleagues signed up for the Movember Challenge to raise awareness and understanding of the health risks men face. The four fine moustaches has brightened the office throughout November and Ex-Change Parts has donated SEK 7000 to fund research programs focusing on men’s health. Ex-Change Parts AB are proud to inform that we have now been ISO 9001:28 certified. The quality system has been implemented during 2014 and in November 2014 we received the certificate. We will be visiting the Helitech Expo in Amsterdam on the 14-15th of October. If you are interested to meet us, pls contact Mr Erik Edgren on erik@ex-changeparts.com or +46 730 88 87 24 to arrange a meeting. On the 18-19th of September our Sales Manager Louise Hülphers attended Erickson Aviation Supplier Conference 2014, held in Ashland, Oregon. 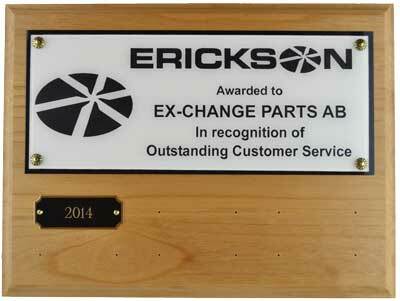 Ex-Change Parts was awarded, among a few other suppliers, a special recognition for good customer service during the past year. For several years Ex-Change Parts has worked closely with Evergreen Helicopters, which was bought and merged into Erickson Aviation 2013. We are glad to welcome Kai Hinrichs to join our team at Ex-Change Parts AB. 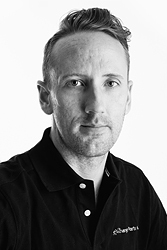 Kai has previously been working 12 years at Patria Helicopters in Stockholm. He will be working with sales of parts and components as well as business development, and will be located in our Stockholm-office.